The THI-9001 3D Printer has achieved first melt today! With much thanks to Dan, Alex, and Patrick at TC Maker! This is the first bit of PLA ever to melt in the Prusa. Curls of PLA stream from the print head. This entry was posted in Mad Science, Maker Tour 2015, Projects by j5mc. Bookmark the permalink. I was looking for discussion of a software/firmware glitch in my Velleman’s heating and I came across this statement about the extruder assembly. obviously your extruder had different instructions but the poster mentioned a side leak like what I saw on your machine. “When you were building the extruder in the instructions there are 2 screw that should have filed down. This step (like all others) is very important. Not filing them down far enough will cause them to rub on the back plate and will stop the bearing from putting the proper pressure on the filament. 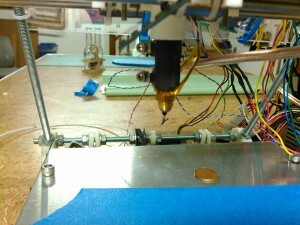 Following up on that — I did tinker with my hotend over the last week or so. 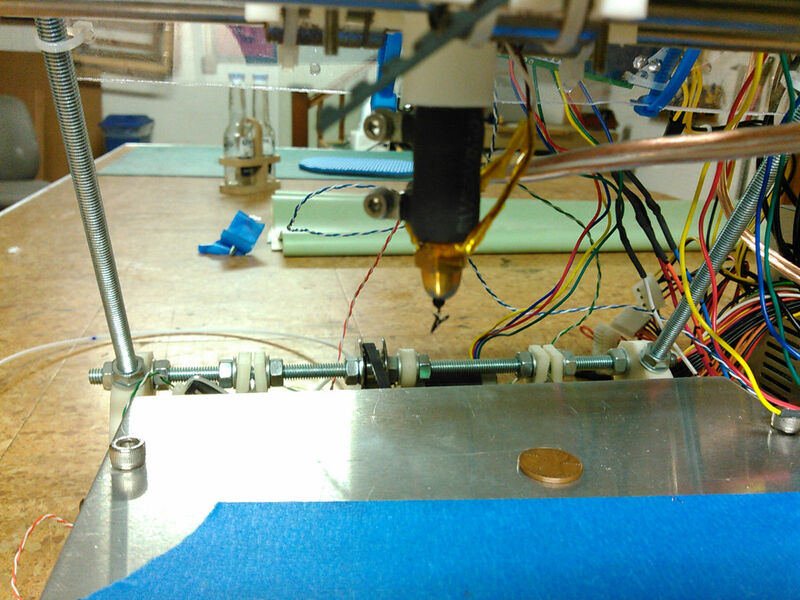 First, I hadn’t really tightened the brass on my extruder head, so there was room for the thermistor between the base of the 8-Ohm resistor heater and the brass extruder tip. Now, the thermistor is kapton-taped right into the middle of the resistor, and the extruder tip is wrenched on as tight as can be. Second, I upgraded my PSU from the 230W unit that shipped with the RepRap kit, to a 500W PSU I picked up for $20 at MicroCentre. Normally I would agonize over a purchase like that, so being in town to pick it up for a decent price was pretty handy! Anyway, the extra supply room keeps the rail voltage ABOVE 12 V, at 12.5 or so, instead of 11.5 on the old PSU. And between the thermistor move, the extra voltage (P = V2 / R), and just the lower surface area of the extruder head, the temperatures I can get are much better. Before, I would struggle to get 180 C, and now it gets 195 C no problem!